When it comes to dessert, wouldn't you want to come to a restaurant named Hot Chocolate? I know I did. But, I also wanted to try their highly regarded burger and other menu items that are sourced from local producers and farmers. Their menu appears to change frequently (like many other restaurants in Chicago), depending on what ingredients are in season. I will say, their desserts and hot chocolate are great and definitely worth trying. Unfortunately, with the food, I was just really disappointed. After having such fresh ingredients, my burger came out overcooked to nearly well-done after requesting a medium RARE preparation. Furthermore, their appetizers are nothing unique and nothing memorable. The hot chocolate is essentially liquid milk chocolate so just think of the word rich as you take your first sip. I am glad I gave it a try, but I would only come back to share a hot chocolate and share a dessert. I will pass on the food for now. For that reason a 3.5-mile rating is all I could give it. With the name Hot Chocolate, how could you skip ordering their famous drink? My family decided to just order one and share it because of all the reviews saying how rich it is. We chose the Medium style Hot Chocolate which was made with milk chocolate, a little dark chocolate, and caramel. It also came with one of their house-made marshmallows. The cup is huge so definitely worth sharing. Rich is an understatement... imagine drinking liquid milk chocolate with a little heavy cream. It is tasty, but may be too much for some. This may have been the only appetizer style dish on the menu... at least one that you could consider sharing with everyone. The pretzel came with two house-baked pretzels with coarse salt baked right in and a pepper jack cheese sauce. The pretzels weren't as soft as I hoped, but that pepper jack cheese sauce made the dish. It isn't as spicy as I would like, but that allowed the pretzel to also shine. Everybody loves Mac & Cheese, but as an appetizer? It seems kind of weird to eating such a heavy dish for an appetizer. However, I was surprised with their version. The Mac & Cheese comes in a small ramekin. I wasn't sure which cheeses are mixed in, but it wasn't strong at all. Doesn't seem like a sharp cheddar is involved. Unfortunately, no crunchy topping on their mac & cheese. This dish with a salad would be a good sized meal. My little brother made a last minute decision to add the pork belly salad to our list of shared appetizers. And we were all glad he did. The dish was made with a mixture of cured pork belly, honey crisp apples, spaghetti squash, shaved parmesan, and pecans. It was dressed with a citrus vinaigrette. The pork belly was lightly seared to make it less fatty and more crunchy. It had that bacon-like flavor to it but with more substance and chew than typical bacon. The apples were sweet and their parmesan was not too strong... my dad even enjoyed it and he dislikes most cheeses. Great salad and great size for an appetizer. I had heard the hamburger from Hot Chocolate is the best in Chicago. This recommendation came from another trustworthy foodie. So I knew I had only one option on their menu... Their hamburger (should be called cheeseburger), is made with a high quality ground beef patty, aged cheddar cheese, house made pickles, and bacon. You have the option for a fried egg, which is a no brainer... YES. All of this is served on a garlic toasted sesame bun. 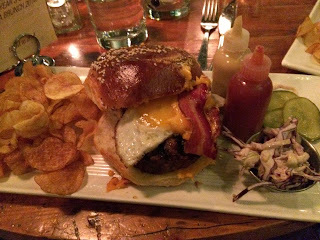 The burger comes with homemade potato chips. I really did enjoy the hamburger except for one thing--mine was overcooked. I asked for medium rare, but received a medium well burger. Somehow though, it was still extremely moist and flavorful. The egg added the richness and the cheddar the much needed sharpness to cut some of the char flavor. The burger presentation is clever with two mini bottles of ketchup and mustard sitting on the plate. Chips are tasty, but way too many fill the plate. Great burger, wish mine was cooked to temperature, will definitely order again though. My older brother decided on the Crab Cake Sandwich. From the picture, it looks a little plain, but inside that house buttered bun, you will find a New England crab cake with lettuce and a giardiniera tartar sauce. Like the burger, it comes with a handfuls of potato chips. My older brother gave me a couple bites of his sandwich and it was just enough to get a nice taste of that tartar sauce. It had plenty of acidity from some lemon juice mixed in. Unfortunately again, it didn't have much spice to it for being a giardiniera tartar sauce. Not sure why their dishes lack heat, but still it was a solid sandwich. My dad was the only person at the table to deviate from the sandwich section. I guess I talked up the burger a little too much. My dad ordered the poussin... honestly, I had no clue what the dish consisted of until I read the description. It was a roasted petite chicken sitting on a bed of fingerling potatoes, raisins, and capers. A little arugula salad sat on the edge of the plate. I had a couple of bites of the chicken. Not only was it tender, perfectly cooked, and juicy, it was full of flavor and had a huge depth of flavor when eaten with both the raisins and capers. Imagine sweet, salt, acidic, and rich. Delicious dish, highly recommended. Having read about all the awards the pastry chef received, my family knew dessert was going to be ordered. The first dessert is perfect for sharing. Called Banana (In Three Parts), this dish comes with banana brioche bread pudding, coconib & vanilla wafer, icebox cake, banana sherbet, chocolate sorbet, and a banana coffee cake sandwich. All together it is a lot more than just banana in three different parts. The ice creams were great, especially that chocolate sorbet sitting on top of the sandwich. The vanilla wafer reminded me of school lunch banana pudding with wafers crushed on top. It is definitely large enough to share and I highly recommend doing so. When I read chocolate and pears on the menu, I was expecting a pear dipped in chocolate. Instead, the plate reminded me of a pear milky way candy bar. It was a chocolate frozen nougat with a chocolate buttermilk cake, port wine poached pear, pear sorbet, and an oatmeal & almond streusel. My favorite part was the pear sorbet. It tasted exactly like a pear and when you eat it with the frozen nougat... the perfect dessert. I thought all the other bells and whistles hurt the dish. The poached pear was unappetizing and the crunchy cookie thing was nothing special. Nothing like an old fashioned before a meal. Glad to see they used an ice sphere to cool the drink. I had it with Maker's and couldn't complain. - The restaurant may be hard to find, if you are going north and head underneath the bridge, you have gone too far. - Don't try buying the take home mix. It is $20 for 2 cups of hot chocolate... yeah, highway robbery.